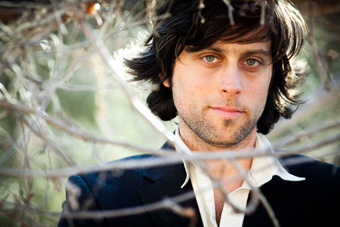 David Berkeley plays polished, folk-inflected pop with clever lyrics and a bright, shimmering sound. According to the New York Times, he “sings in a lustrous melancholy voice with shades of Tim Buckley and Nick Drake.” The Boston Globe praises his “emotional story-telling lyrics, charismatic stage presence, and hilarious anecdotes,” and the San Francisco Chronicle calls him a “musical poet.” He has released six albums, including his latest, The Fire in My Head, recorded in Santa Fe, where he recently moved with his wife and two young children. Joining him tonight will be Bill Titus on guitar, keys, organ, and drums, and Jordan Katz on trumpet and banjo. David is a story-teller and writer now at work on his second collection of stories. He’s particularly interested in the difference between songs and stories – what is only expressible in a song? He has appeared on World Café, Mountain Stage, and This American Life. ASCAP honored him with its prestigious Johnny Mercer Songwriter Award. “Your heart is like a parachute,” he sings, “it opens when you’re falling down.” He was named for the City of Berkeley, where his parents lived before he was born – and now he’s back in town for a show!